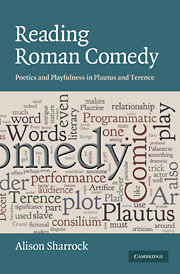 Alison Sharrock, Reading Roman comedy: poetics and playfulness in Plautus and Terence, Cambridge; New York: Cambridge University Press, coll. "W.B. Stanford memorial lectures", 2009. xi, 321 p. $99.00. Extraits en ligne sur le site de l'éditeur, books.google et amazon.com. For many years the domain of specialists in early Latin, in complexmetres and in the reconstruction of texts, Roman comedy has onlyrecently begun to establish itself in the mainstream of classicalliterary criticism. Where most recent books stress the originalperformance as the primary location for the encountering of the plays,this book finds the locus of meaning and appreciation in the activityof a reader, albeit one whose manner of reading necessarily involvesthe imaginative reconstruction of performance. The texts are treated,and celebrated, as literary devices, with programmatic beginnings,middles, ends and intertexts. All the extant plays of Plautus andTerence have at least a bit-part in this book, which seeks to exposethe authors' fabulous artificiality and artifice, while playing alongwith their differing but interrelated poses of generic humility. ALISON SHARROCK is Professor of Classics at the University of Manchester. She is also the author of Seduction and Repetition in Ovid's Ars Amatoria 2 (1994) and Fifty Key Classical Authors (with Rhiannon Ash, 2002), and co-editor of Intratextuality: Greek and Roman Textual Relations (with Helen Morales, 2000) and The Art of Love: Bimillennial Essays on Ovid's Ars Amatoria and Remedia Amoris (with Roy Gibson and Steven Green, 2006).